Termite.com.au Consumer Guide to Pest Control Services in Victoria - learn about destructive termites in Casterton VIC region - other pests in Casterton VIC region - recommended termite control methods - the safer more effective pest control products - pesticide safety issues - consumer protection advice AUSTRALIAN PEST CONTROLLERS ASSOCIATION INC.
Modern pest control products although much safer to use in and around living areas - modern pest control technologies are more expensive - require a far higher level of skill to ensure an effective result. Termites infiltrate Casterton homes - will Yours be next? 1 in 3 homes - recent industry surveys suggest about one in three of homes in Victoria will suffer a termite infestation - actual figures for the Casterton VIC region may be higher due to the highly destructive local termite species - other local environmental factors favouring widespread termite colony development - and the type of construction of buildings in the Casterton region that allow undetectible termite entry into the wall and roofing timbers. Fortunately the new hi-tech termite control products from USA - Termidor and Premise termiticides are now available in VIC which offer 100% termite protection in the vast majority of situations. Termidor and Premise termiticides - used to treat the soil abutting the base and perimeter of a building - acts to prevent termite entry into the building AND by a unique delayed transfer effect can eliminate termite nests near the building - both termiticides have been used and tested in USA and Australia for more than 10 years - both have an excellent reputation as reliable termite control products. Non-repellant Termidor and Premise work differently to other soil treatment termiticides - termites cannot detect these chemicals in the soil - it sticks to their skin - some die straight away - others transfer the chemical back to the central colony nest and is spread to other termites (and the queen) by their mutual feeding and grooming habit - highly effective at termite colony elimination. Subterranean termites constant forage for new food sources - when tunneling in the Termidor or Premise treated soil area next to the building - ie in higher concentration areas near point of application - are killed outright or within a few hours. 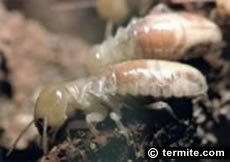 Subterranean termites when tunneling in the outer parts of a Termidor or Premise treated soil area - ie in the lower concentration areas - cannot detect the chemical which sticks to their bodies - a delayed lethal effect of a few days - enough time to be transferred back to the central colony nest. Transfer effect - some affected termites carry the termiticide back to the central colony nest - termites groom each other regularly - eating fungi and the termiticide from the skin of other termites - they also transfer the termiticide with partly digested timber when the worker termites feed other dependant termites - if the queen termite is killed then the entire termite colony will be eliminated. Cannibals - Subterranean termites cannibalise or carry away termites killed from ingesting the termiticide - this further spreads the deadly effect of the termiticide - eliminating the entire colony. Subterranean termites are known to attack buildings in the Casterton VIC region and cause severe damage to roofing and wall framing timbers within a few months of the initial infestation. To best protect your property we strongly recommend you read the Termites section of this web-site to help you assess your property's level of risk, and if need be, to choose which of the termite control methods will best protect your property. Termite control options aim at exploiting certain behavioural characteristics of subterranean termites in varying types of building construction and environmental situations - click here for info on termites in the Casterton VIC region. Spider Identification Chart with FIRST AID spider bite procedures - a ready reference guide in full colour of dangerous and venomous spiders that commonly occur in the Casterton VIC region.